What is a dream holiday without the sea? Thousands of sun worshippers, beach lovers and children flock to Hong Kong's family-friendly seashores in August and September to soak up the sunshine and enjoy the last remnants of summer. 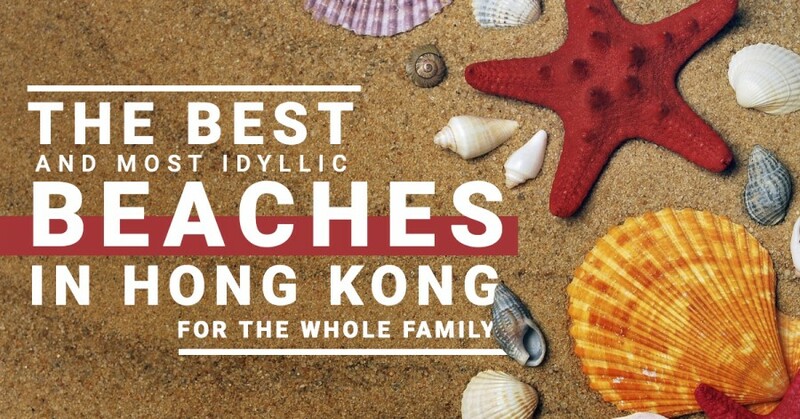 Whether you are planning a family leisurely weekend or a city escape, discover TickiKids’ round-up of the best government-maintained beaches in Hong Kong for a great day out. Big Wave Bay is arguably Hong Kong’s most popular beach among surfers, whether they are dab hands at surfing or absolute beginners. Of course, there is no need to be a surfer to ace a free-spirited day by the picturesque coastline on the eastern end of Hong Kong Island close to the Dragon’s Back hiking trail, and discover its prehistoric rock carving. Perhaps, this middle-sized beach tucked away in the hills will be a delightful source of invigoration for beach bunnies who will enjoy swimming, the sun and sand at this surfer’s paradise. Check out the current surf report for the Big Wave Bay HK before your next surf session. On site, there are a few facilities, including surf equipment rental shops, fast-food kiosk, restaurants and cafes, public barbecue pits (20), changing room, shower and toilet, shark prevention nets, lifeguards in season. Saturdays, Sundays & Public Holidays (8 am - 7 pm). Getting there: Big Wave Bay Road, Shek O, Hong Kong Island. MRT station – Shau Kei Wan Station, Exit A3. Take a bus № 9 to Big Wave Bay Beach. Shek O Beach is the dreamiest holiday spot for a family visit. It is widely accepted that the earliest memories of carefree childhood come from the sea. Take your children for a good day out on the sprawling sandy beach that stretches along the south-eastern part of Hong Kong Island. The name "Shek O" means the "rocky bay". Being sheltered by dramatic cliffs on both sides it becomes an ultimate playground, where your little ones will enjoy building enormous sandcastles after a swim in the perfectly clear and calm water. The beach features a light refreshment restaurant, surf equipment hire, shark prevention net, BBQ Pits (39), changing rooms, shower facilities, toilets, raft, playground, car park (including 3 accessible parking spaces) and obstacle golf course. Getting there: Shek O Beach lies on a peninsula to the east of Hong Kong. Reach it by bus from Shau Kei Wan. Take the MTR to Shau Kei Wan, take exit A3 and afterwards catch the bus № 9 to Shek O. You can also take a taxi from Shau Kei Wan! This spectacular secluded beach is a top spot for families with kids that offers the best of both worlds. Located on the western shore Chung Hom Kok in Chung Hom Wan, on the southern side of the island, in close proximity to Stanley, the beach is nearly always deserted on weekdays. It’s almost impossible to see it from above, as it's hidden in lush vegetation. Once you reach the Chung Hom Kok Beach, you'll discover a brilliant stretch of golden soft sand, clear water and stunning scenery of leafy hills landscape. Along the way, children and their parents will be rewarded with two big slides, two swings, two bouncing horses and lots of balancing and climbing activities. This government-run beach includes all the basic amenities, including lifeguards, shark prevention nets, snack kiosks, toilets, changing room, shower facilities, barbecue pits, raft and playground. Getting there: Located at the southwest part of Hong Kong Island, between Repulse Bay and Stanley. Chung Hom Kok beach can be reached from Central (Exchange Square) via bus № 6 to Chung Hom Kok – hop off at the roundabout, walk downhill and turn left to reach the staircase. The Turtle Cove Beach, also known as Sham Wan, is located between Stanley and Tai Tam Reservoir. This secluded cove reaches a length of approximately 60-70 metres and might be small, but it’s excellent. The first thing that strikes you about this beach in the south of Hong Kong Island, is the calm, exceptionally clean water, pristine sand and oases of greenery that covers the surrounding hills. The beach is the last known nesting place for Hong Kong’s endangered green turtles, but they haven’t been spotted nesting here since 2012. Thus, it’s very important to keep this place clean. Hidden at the bottom of 200-ish stairs, this deserted stretch of sand could quite possibly be a cove all for yourself. There is no chance of playing beach-mat overlap with others. The weathered boulders bookend the seashore, and there are no food kiosks or restaurants, so we would recommend coming prepared with your own supplies. Among featured facilities are shark prevention nets, BBQ area, BBQ Pits (12), changing room, shower facilities, toilet, raft and playground. Getting there: By ferry from the Aberdeen Waterfront or from Sai Wan Ho MTR station take a bus № 14 to the Tai Tam Reservoir. Tai Long Wan is arguably the most awesome bay located in Hong Kong's northeastern corner, on the east coast of the Sai Kung peninsula. These four beaches along the bay – Sai Wan (West Bay), Ham Tin Wan, Tai Wan (Big Bay) and Tung Wan (East Bay) – rank among the finest, making it a truly undiscovered pocket of paradise. Backed by woody picturesque hillsides and overlooking the clear water, Tai Wan, one of the island's longest and most spacious beaches, isn't easy to reach but it's definitely worth the journey. This spectacular beach is a great place for overnight camping and surfing, and it’s mostly deserted during the week. We think it might be the ultimate seaside retreat. Be warned! You are not, officially, supposed to swim here! Getting there: From Sai Kung take Bus 94 to Wong Shek Pier. From there it is a short boat ride ($20 per person) to the start of the trail. Located at the foothill of Shouson Hill, on the south of Hong Kong Island near to Repulse Bay, Deep Water Bay Beach is less famous among tourists. Stretches of soft golden sand and deep blue water make Deep Water Bay a popular beach among locals, although it is crowded most of the time. Weekends, in particular, can get crowded here! The nearby Seaview Promenade and Mills & Chung Path are perfect for joggers and walkers. Changing rooms, shower facilities, toilets, raft and fee-charging car park and barbecue pits are available. Getting there: Island Road, Deep Water Bay. Buses number 6X and 260 go to Deep Water Bay from Central, as well as buses number 973, 63 and 65. Find out more information about the public beaches at the Leisure and Cultural Services Department website!